In advance of the Beijing Olympic Games of August 2008 the entire Beijing City Railway and Subway/Metro System was updated and expanded to include many new Stations and Lines. Below is a complete Map of the System in Operation during the 2008 Olympic Games. 2015 Beijing Metro/Subway System Map. 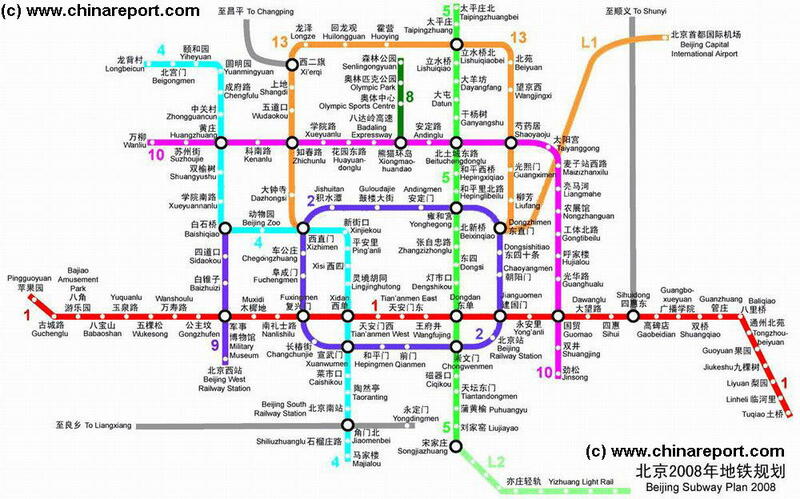 The Original Beijing Subway System only had two lines. These were the Liniar Red Line, running through the North Side of TiananMen Square (TianAn Men East- and West- Stations) and along Chang An' Avenue, and the Blue Circular Line, which mainly followed the route of the former Ming Dynasty Era City Walls which themselves had been turned into the Second Ring Road. Both of the early lines were constructed in the late 1960's. Naturally, the advent of Modernity, the Beijing Olympic Games and not the least the booming of Private Car ownership (in combination with a red hot economy) gave Rise to the need for a more efficient and cost affective mode of transport for all City Citizens. For this reason, massive changes were made to the Beijing Public Transportation System, especially the Subway/Metro System, resulting in 2008 in a new modernized system, giving access to all main Tourist and Commercial Sites as well as the Institutes of Government and Institutes of Higher Learning.